At Simply Prep Meals our ethos is simple, we offer a premium healthy meal prep delivery service at affordable prices. We believe in using only the finest ingredients. 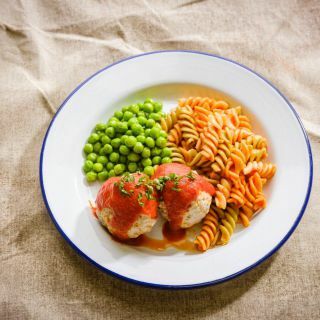 Our meat is British and fully traceable, even our Grill up chicken sausages are prepared to order by a local butcher, we make our own meatballs and our seasonings and sauces have been carefully created and crafted by us, they are 100% gluten, sugar and fat free. Our recipes our unique to us and we believe in using minimal ingredients for maximum flavour. Your healthy nutritious meals are prepared in a 5 star hygiene rated commercial kitchen before being delivered cool, fresh and free to your door. Healthy meals and fitness food you can trust from the UK’s No1 meal prep company. We believe meal prep doesn't have to be boring or complicated, just pick one of our plans or build your own meals, then leave the rest to us! Giving you more time to reach your goals knowing your macros are in safe hands. We can accommodate all meal prep plans, allergies and dietary requirements and are happy to offer an nutritional advice. 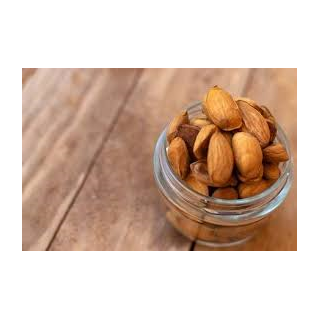 Although all our seasonings are nut free we may use ingredients from a third party that have been produced in a factory that have come in contact with nuts or their derivatives. * Please note all proteins are uncooked weights and carbohydrates and vegetables cooked weights. 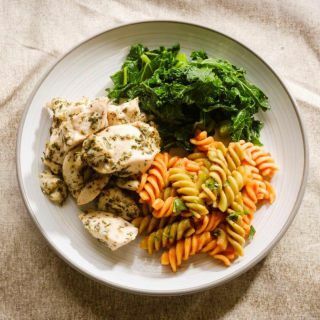 At Simply Prep Meals we use only 100% British Red tractor chicken breast, with no added water or fillers, just high protein pure and simple! There's nothing bland about our seasonings. Our unique blend of herbs and spices contain no salt, sugar, gluten or fat- they have been carefully created by our team of talented chefs so they won't affect your macros. They're 100% clean and compliment our tender chicken perfectly. There's nothing bland about our seasonings. Our unique blend of herbs and spices contain no salt, sugar, gluten or fat- they have been carefully created by our team of talented chefs so they won't affect your macros. 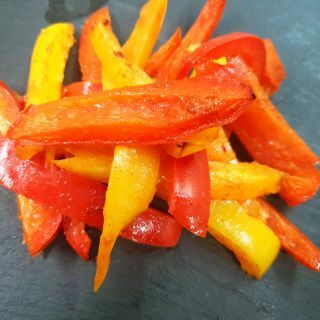 Spicy peri peri is a blend of paprika, chilli and other unique spices. They're 100% clean and compliment our tender chicken perfectly. There's nothing bland about our seasonings. Our unique blend of herbs and spices contain no salt, sugar, gluten or fat- they have been carefully created by our team of talented chefs so they won't affect your macros. 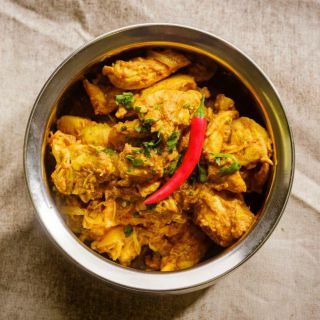 Tandoori is a blend of tumeric, cumin and other eastern spices.They're 100% clean and compliment our tender chicken perfectly. 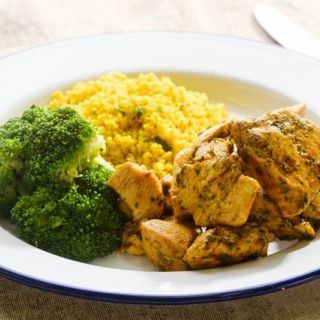 You don't have to feel guilty eating our high protein, infamous lean chicken curry. 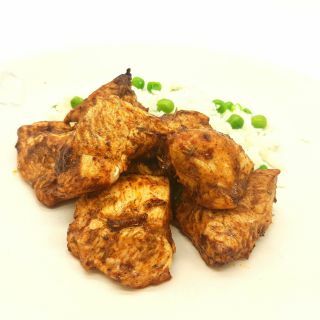 We marinate chicken breast in authentic Indian spices and use only 4 ingredients to make our clean curry taste so good. With Simply Prep curry is no longer a cheat meal and you can still meet your macros.....! 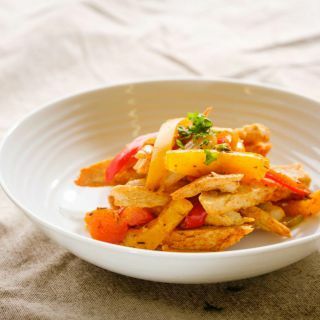 Protein rich quorn filet with a melody of peppers and onions, spiced using a smokey seasoning. Who said that being a vegetarian means you can't have high protein food that will meet your macros? 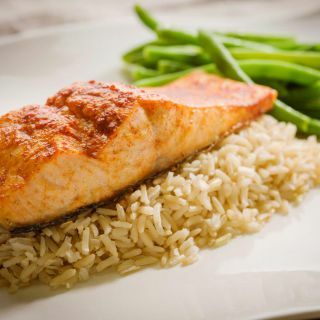 Salmon steak lightly dusted in Paprika before roasting to give a smokey flavour to this healthy oily fish, high in omega 3 fatty acids and protein rich. A Tilapia filet roasted to perfection with lemon to compliment the flavour. 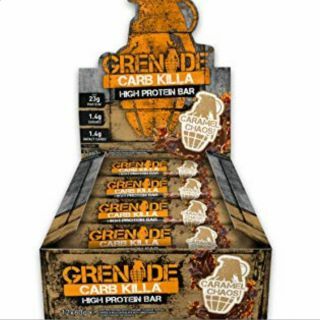 Packed full of lean protein and naturally low in fat and calories. Turkey may be the leanest of meats but it can also be the dryest. 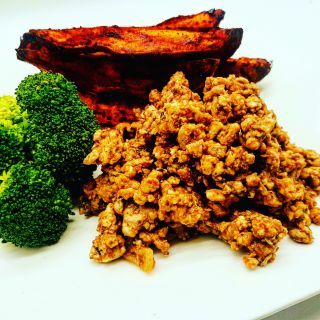 At Simply Prep we have dispelled that myth, we combine turkey breast mince with protein rich egg white and herbs which are marinated in our homemade light tomato sauce. 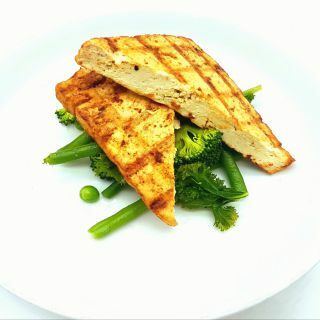 High protein low fat perfect for those stripping fat or looking for a diet meal. No meat? No problem....you can still meet your macros with Simply Prep. 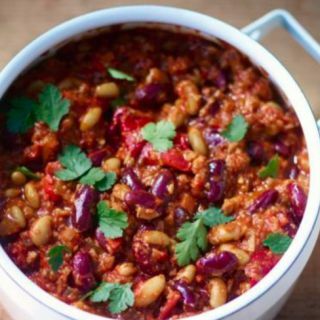 High in protein quorn mince , kidney beans and lightly spiced. Low in fat but high in taste! Another perfect diet meal! 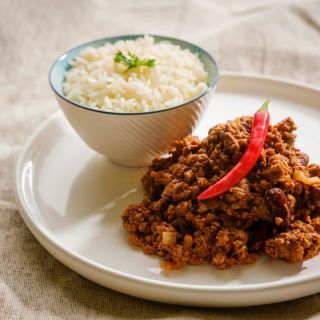 Our renowned beef chilli is a special blend of lean steak mince, kidney beans and spices in a tomato based sauce. 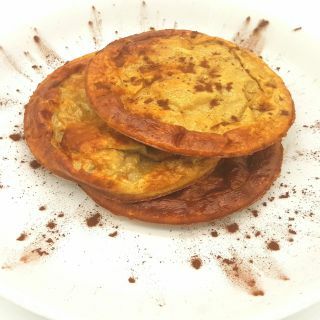 Again only 4 ingredients making this dish high in protein and low in fat. Vegan friendly 5 bean chilli. A smokey, spicy mix of 5 delicious mixed beans. High in complex carbs and protein, but low in fat. salt or sugars. 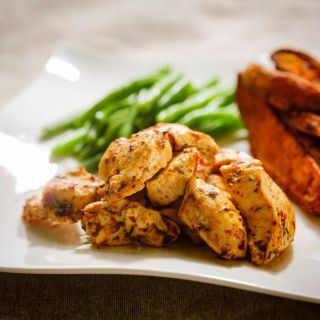 We use 100% British chicken breast with no added water or fillers, just high quality protein pure and simple. 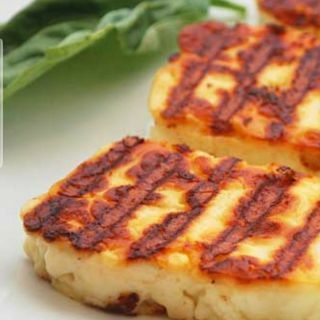 Grilled slice of halloumi, high in protein. 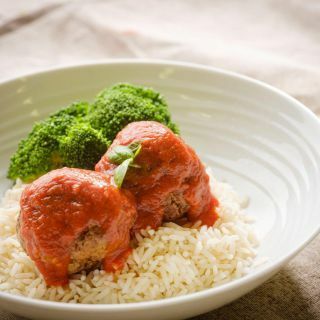 These juicy meatballs are a combination of high protein lean steak mince and subtle smokey chipotle spices, lightly covered in our delicious macros friendly clean tomato sauce. 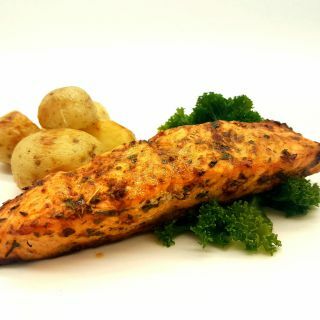 Our hand cut fresh salmon steak seasoned with our own peri-peri seasoning. Packed full of good fats and high in protein. 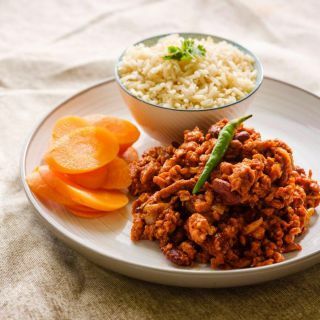 Lean turkey mince with a blend of Italian spices, onion and a light tomato sauce. 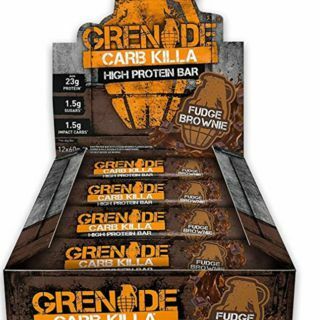 High in lean, good quality protein, low in fat and still tasting amazing! 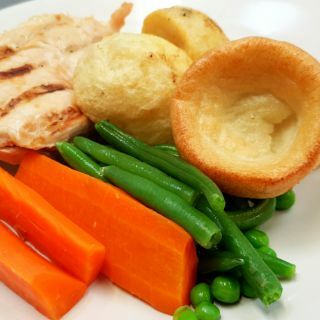 A whole grilled chicken breast with Yorkshire pudding, peas, carrots and gravy. Recommended with our crispy roast potatoes. Add a third vegetable of your choice. The gravy is served in an individual pot. A vegan friendly protein source, lightly seasoned and grilled. Tofu is high iron, calcium and magnesium. 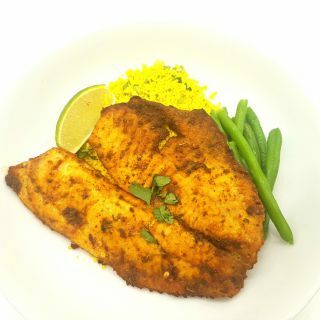 Grilled filet of lean high protein tilapia marinated in our hand made tandoori spicy seasoning. A homemade burger made from lean turkey mince seasoned with a blend of fragrant thai spices. 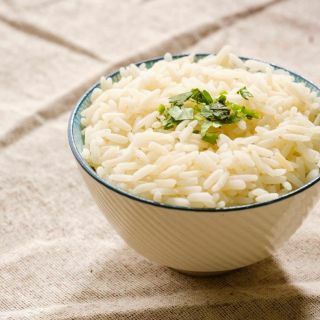 Our white rice is steamed to perfection, the perfect accompaniment to any of our nutritionally balanced meals. 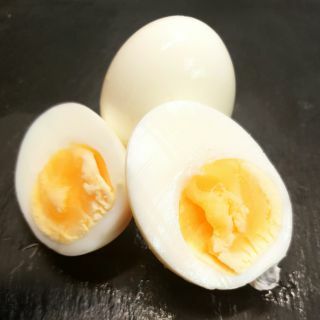 It's also low in fat, high in carbohydrates and even a source of protein. 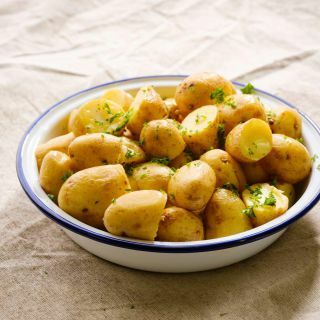 New Potatoes are a very good source of vitamins B6 and C, low in fat and now regarded as a superfood! Nutritionally it's still one of the best! 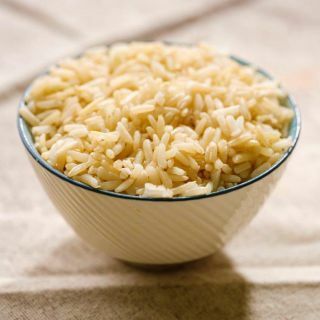 Brown Rice is a great source of energy. 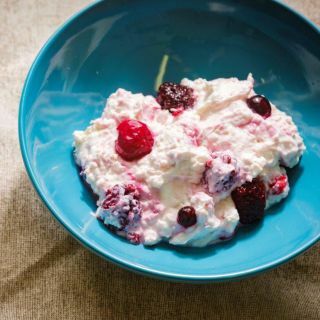 Full of fibre and a slow releasing carbohydrate, a perfect accompaniment to any of our nutritionally balanced meals. 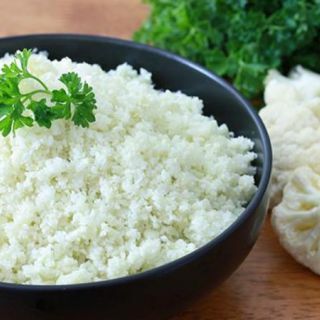 A healthy low carb alternative to rice, perfect for those looking to cut back on carbohydrates. 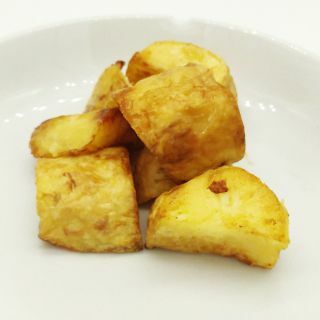 Crispy homemade roast potatoes. The perfect accompianment to our Simply Roast Dinner. 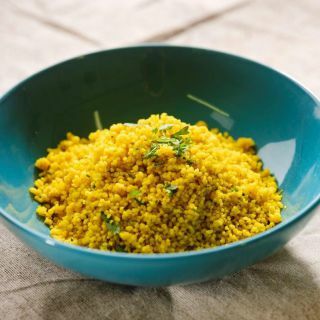 Our Moroccan spiced cous cous is lightly seasoned with our unique blend of spices. Low in fat, high in carbohydrates and even a source of protein. 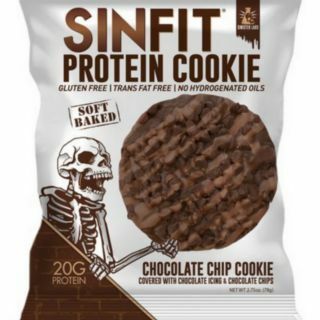 Perfect for those nutritionally balanced post workout meals. 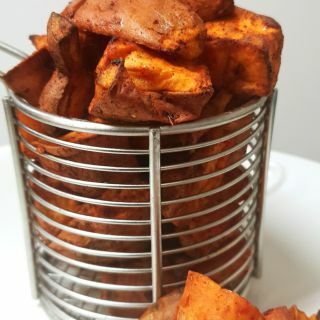 Sweet potato blended with paprika and a touch of butter for a sweet, creamy and smokey taste. 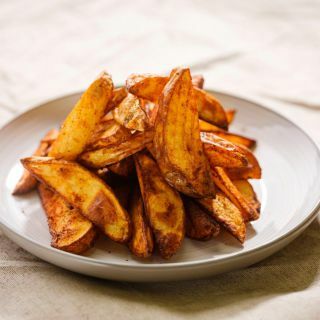 Our hand cut chunks are lightly seasoned with Paprika for a smoky sweet flavour. 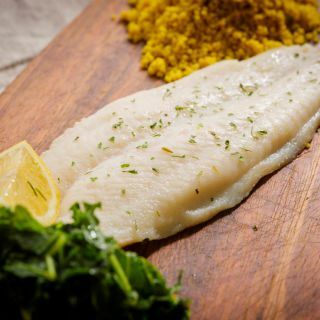 This superfood is nutritionally high in vitamins A, C and B6, low in fat and a great source of carbohydrates, great with any of our high protein meals. 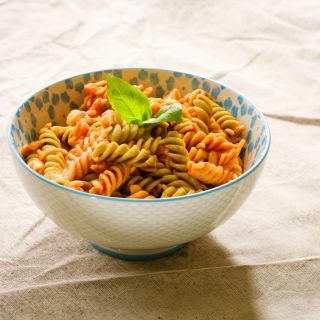 Nutritious Tri-Colour pasta is a slow releasing carbohydrate full of fibre. Lightly covered in our macro friendly homemade signature tomato sauce. Gluten free pasta available on request. Please on the order page select gluten as an allergy. Crispy on the outside, fluffly inside. 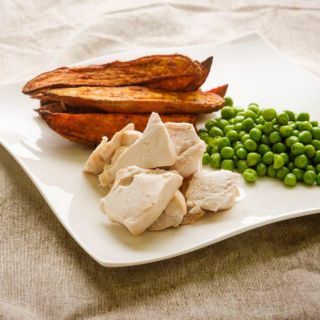 Our handcut wedges are a great form of carbohydrates and go perfectly with any of our nutritious high protein meals. All our vegetables are steamed to lock in their flavour and nutrients. 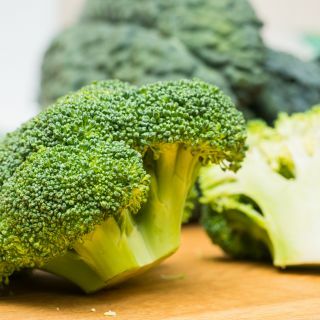 Broccoli is nutritionally packed full of vitamin B6, E and A aswell as Magnesium. Easy to make up your macros! All our vegetables are steamed to lock in their flavour and nutrients. 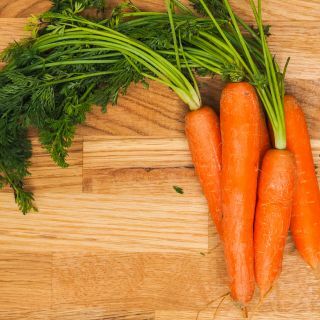 Nutritionally carrots are a great source of beta carotene, vitamins A, C, K and B8. Easy to make up your macros! All our vegetables are steamed to lock in their flavour and nutrients. 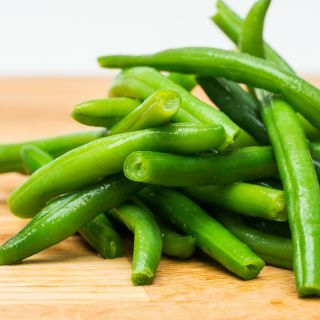 Nutrionally green beans are a rich source of vitamins A,C and K, as well as folic acid and fibre. Easy to make up your macros! All our vegetables are steamed to lock in their flavour and nutients. 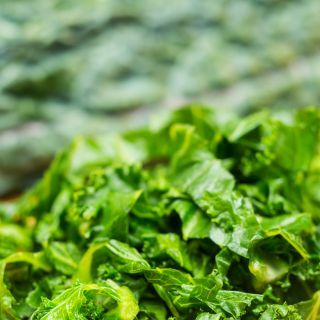 Nutritionally kale is low in calories and high in fibre, as well as being a superfood! Its full of iron, vitamins K, C, A, antioxidents and has more calcium than milk! Easy to meet your macros! A mix of our green superfoods. Please note nutritional value is an average for this product. Mixed roast peppers. Packed full of flavour and micronutrients. All our vegetables are steamed to lock in their flavour and nutrients. 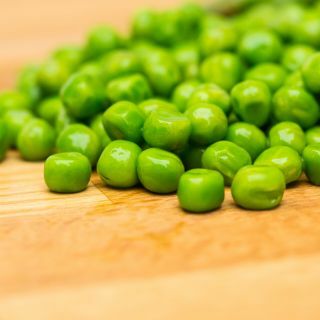 Nutritionally peas are a rich source of vitamins A, C, K and a great source of protein. Easy to meet your macros! 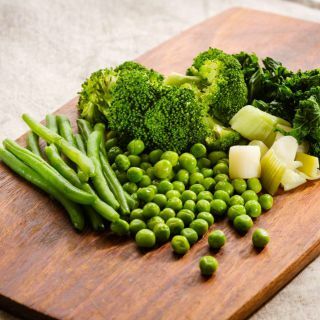 All our vegetables are steamed to lock in their flavour and nutrients. 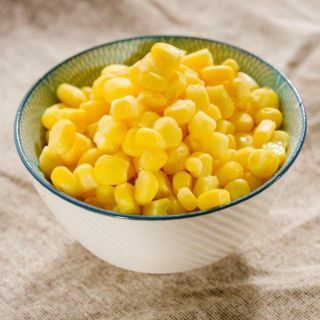 Nutritionally sweetcorn is loaded with lutein and zeaxanthin, two phytochemicals that promote healthy vision. Easy to meet your macros! Chocolate and Berry pancakes packed full of protein. Perfect start to any day. 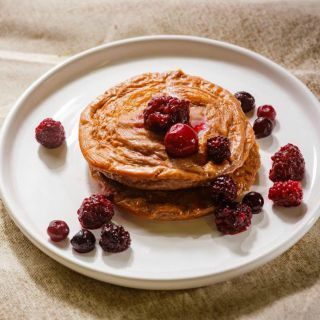 These nutritious pancakes are high in protein, low in fat and a great complex carbohydrate. Simply Prep's take on an old classic! Introducing the Grill Up! 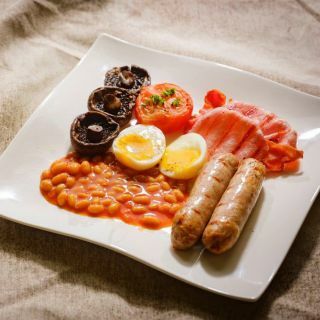 Hand made chicken sausages, grilled bacon, tomato, field mushrooms, baked beans and a hardboiled egg. 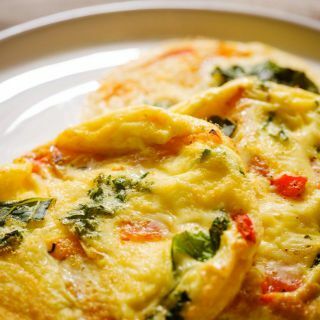 A high protein meal, low in fat, a great start to the day! A protein packed breakfast of eggs, brown rice, kale and roast peppers. Your perfect nutritious start to the day! 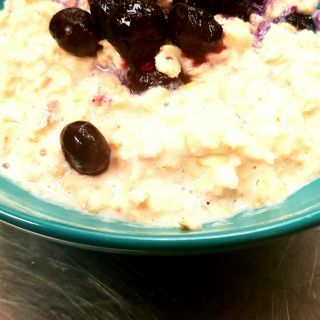 Warm up these cold mornings with our delicious vanilla protein porridge topped with fresh blueberries. 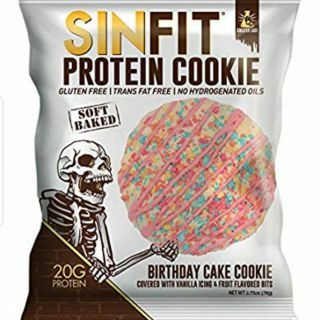 Loking for a quick protein hit?